Rearranging spaces, shifting energy, transforming lives. Do you feel stuck? Do you wish you could open the door to more wealth, harmony, love? At Feng Shui For Real Life, Master Practitioner Carol Olmstead will show you how a few simple Feng Shui adjustments can shift the energy around you and help you attract what you are seeking in your personal and professional life. Feng Shui (pronounced "fung shway") is a design system for arranging your surroundings in harmony and balance with the natural world around you. Your surroundings have a powerful effect on what you attract into your life. So many of us clutter our homes, offices, and workplaces with things that symbolically represent the emotional clutter we feel inside. When the energy around you is blocked, your prosperity, relationships, health, and well-being can be affected. When the energy is balanced, good things naturally flow into your life. A sought-after consultant, dynamic speaker, and critically acclaimed author of the Feng Shui Quick Guide For Home and Office and 365 Feng Shui Secrets, Carol demystifies this 5,000-year-old design tradition and shows you how to unblock energy and transform your life. In this rapidly changing world, your surroundings are the one thing you can control, and Carol will show you how. Attract wealth, harmony, love, and much more. Read the current issue of Carol's e-magazine. This month's Feng Shui To The Rescue newsletter features tips about growing your career with plants and flowers, what to do with old journals, small successes, master bedroom colors, and much more. Read the current newsletter. BRING THIS WORKSHOP TO YOUR AREA! Finally, a practical and easy to understand Feng Shui book! 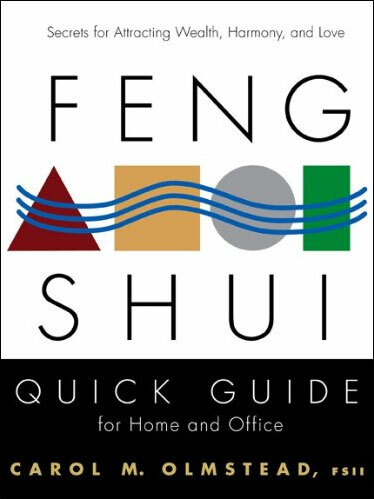 The award-winning Feng Shui Quick Guide for Home and Office includes easy-to-follow basics plus secrets to make the practical magic of Feng Shui work for you. Includes success stories from real people who followed these tips with big results. This book will help you attract wealth, achieve harmony, improve relationships, advance your career, and clear clutter.